Enjoy great trimaran sailing on the 'Fe' down the great barrier reef coast of Cozumel, surrounded by crystal clear waters. Arriving at our special snorkel reefs, you'll grab your snorkel gear for your 2 stops. 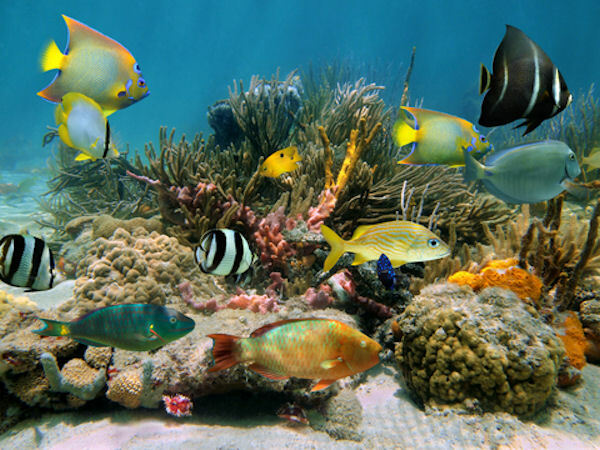 Here you will view corals, fish and a multitude of sea life. While on board you will be served drinks and chips with salsa and guacamole. Minimum age to participate in this tour is ten (10) years of age. Come experience the zip lines and bird's eye view of both sides of Roatan while sliding through the air. You'll see wildlife from the tree tops. A guide will assist you in your exciting adventure as you leave each platform. You will be met by a guide at your arrival onto the next platform. Our Zip Lines are built so that the use of a pull brake is not necessary. Just relax, enjoy the ride and take pictures! COZUMEL: Don't forget your camera. Bring your towel, a change of clothes and sunscreen. Shade available. Minimum age to participate is ten years old. Due to possible heavy boat traffic it is important for all guests be on time for the tour. ROATAN: Please wear comfortable clothing as you will be wearing harnesses. Be sure your shoes either tie or have straps to assure they will not fall off while zip lining. Maximum weight for the zipline is 300 pounds. You will also want to remember sunscreen, insect repellant and your camera. You will spend about forty minutes ziplining. Travel time is approximately thirty minutes from the Mahogany Bay pier and about twenty minutes from the Roatan pier. Tour times are local time. PLEASE NOTE: Lockers are available for rental at the zip line ($1 each) and the beach ($5 each) prices are subject to change. All personal belongings should be taken with you. Tour operator is not responsible for any items left in unattended vehicles. Cozumel: The specific meeting location at the pier will be listed in your confirmation email and voucher for this shore excursion. See the 'Redemption and Voucher Details' section below. Depending on where your ship docks in Cozumel a taxi may be required to and from the meeting location for this excursion. Roatan: At the cruise ship pier. The specific meeting location at the pier will be listed in your confirmation email and voucher for this shore excursion. See the 'Redemption and Voucher Details' section below.